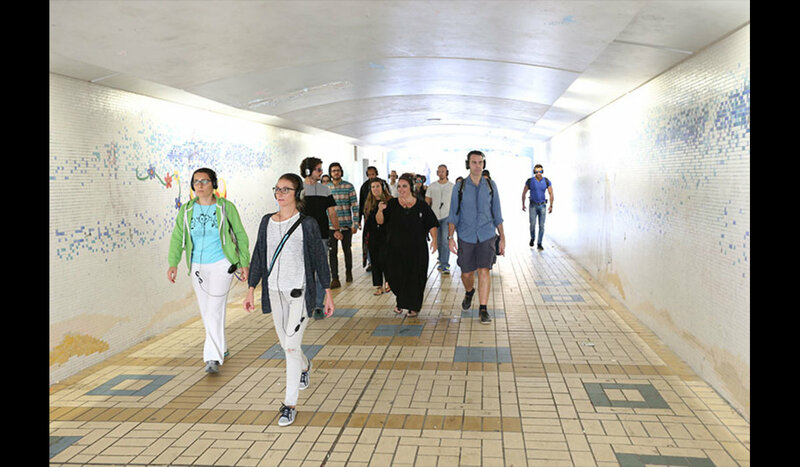 Abu Dhabi, November 19, 2018: The Arts Center at NYU Abu Dhabi takes its patrons from the seats of the theater to the streets of Abu Dhabi, as Remote Abu Dhabi by Rimini Protokoll journeys through a digital and visual exploration throughout November and December 2018, as well as January 2019. A computer generated voice guides headphone-wearing participants on a walk through the city. Familiar and unfamiliar sites come to life as if immersed in an imaginary science fiction film set. Part of the extended international projectRemote X, this site-specific experience addresses the imminent reality of artificial intelligence in the cities of the future.Remote X uses the world as a sort of mobile research experimental lab, building on the dramatic structures of previous hosting venues; these have featured in 24 cities globally across Europe, Russia, India, the Americas and beyond. Each new city poses as a foundation of previous shows, but continues to write new storylines with each new site. The Abu Dhabi edition – Remote Abu Dhabi – is a reprise presentation in which The Arts Center joins forces with Abu Dhabi Art: an annual art fair organized by The Department of Culture and Tourism – Abu Dhabi. It is part of Durub Al Tawaya, the performing arts program of the art fair. Rimini Protokoll was created by Helgard Haug, Stefan Kaegi, and Daniel Wetzel. This team of author-directors has been working together since 2000, seeing their practice include theater, sound, and radio, along with film, and installation. Protokoll’s aim is to use their theatrical tools to devise unusual perspectives on reality. Speaking about the growing art scene in the capital with events such as Abu Dhabi Art, Executive Artistic Director at NYUAD Arts Center Bill Bragin said: “When I first moved to Abu Dhabi, I was thrilled to see that Durub al Tawaya was already bringing remarkable performance to Abu Dhabi. I was transfixed by my experience as an audience member forRemote Abu Dhabi which helped me see my new home in Abu Dhabi in different ways. I also found a kindred curatorial spirit in Tarek Abou el Fatouh, and I’m delighted that he’s been able to bring us and Abu Dhabi Art closer together with this piece, which activates the city so inventively”.